Long before Pirates of the Caribbean - At World's End even started filming, the buzz was every where about the addition of Keith Richards to the cast. 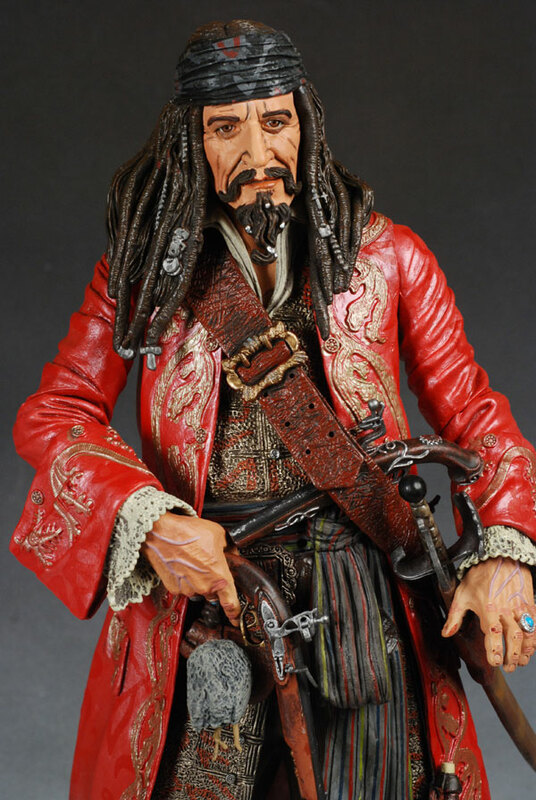 Johnny Depp had made it widely known that part of his interpretation of Jack Sparrow was based on the personality and mannerisms of Richards, so when it was announced that the famous Stone was going to be playing Sparrow's father in the third film, everyone was interested. 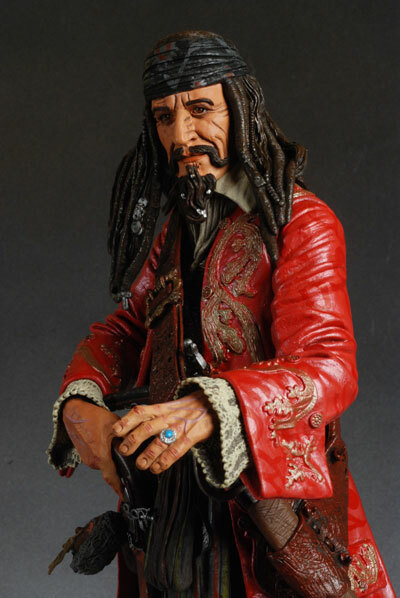 And while the reviews of the final film were mixed, most folks did agree that Keith's few minutes on screen as the intriguing Captain Teague were a highlight of the film. NECA is producing a 7" and 18" version of Teague, both of which are now out. 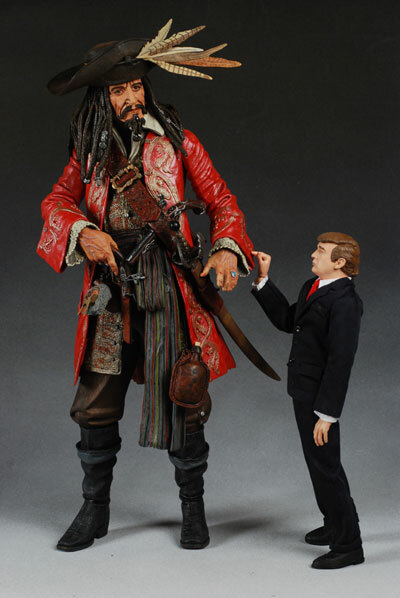 I'm hoping for a 12" version as well to go with the 12" Jack and Davy, but I haven't seen anything announced yet. You can pick up the 18" version for around $35, depending on the retailer. Your best bet is online, although he may make an appearance at some FYE or Suncoast stores, or your LCS. I like boxes, and I like boxes that protect the figures inside. This package is both. However, there's really not much else to sell it. The diecut photo on the front does a good job of adding additional support to the plastic window, but there's a lack of descriptive text and the other graphics are pretty bare bone. There's a ton of twisties of course, and the package isn't collector friendly - you'll have to tear the interior bubble off the interior cardboard tray to get at the pistols. 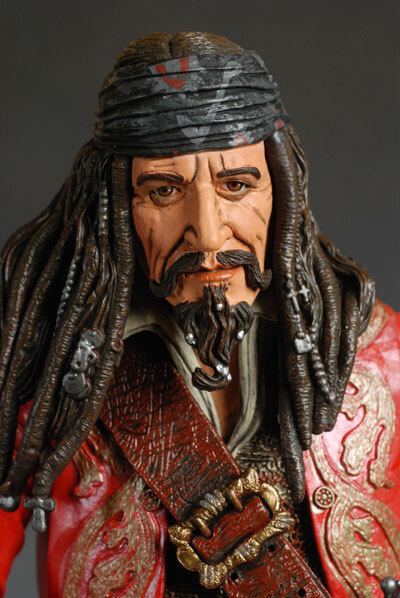 As yoiu may recall, I loved the original 18" Jack Sparrow. I think the head sculpt is still my favorite Jack so far, and the overall quality was top notch. He looks terrific on the shelf, and I highly recommend him. Unfortunately, the sculpt on his dad didn't turn out quite as well. The general resemblance is there, but it suffers from 'up sizing'. The sculpt was really designed for the 7" line. That meant that to get great detail in the wrinkles of the face, it required broad detail at the larger scale. Shrink that broad detail down and voila! You get some excellent small detail. Unfortunately, when you look at that detail at the large scale, merely upsized, it loses much of it's sharpness. The sculpt gets rougher, and in this case it's so rough that it reminds me of something carved out of wood by Native Americans 100 years ago. The wrinkles are very deep and broad, and the dark paint only accentuates the effect. Other areas lack necessary detail, like the moustache, which ends up looking more like Tootsie Rolls under his nose. This was a head sculpt that really needed to be reworked for this much larger scale rather than simply being increased in size. Keith has lived a hard life, and it's readily apparent in his appearance, but even he doesn't have wrinkles quite like this. The body sculpt doesn't suffer as badly from the loss of detail. There's some nice texture work on the various pieces of clothing, and some terrific items added to his belt, like the flasks or the shrunken head. But the body suffers from a weird pose, especially with the right arm and hand. 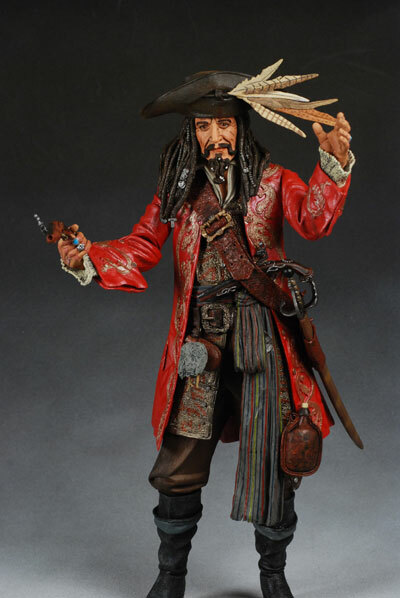 The design allows him to hold one of the flintlocks pointed down in front of his body, but it doesn't look right to me at all. It appears uncomfortable and awkward, as if he's looking to stick the gun in a belt or holster that doesn't exist. The positioning of the head, torso and legs isn't bad, but the awkward arms hurt the otherwise good body work. You know the speech - great paint can improve a weak sculpt, weak paint can ruin a great sculpt. Here, the great paint on the body is hurt by the lackluster job on the face. The dark wash used to highlight the wrinkles and furrows does its job a bit too well, over emphasizing how deeply and broadly they are cut. This just adds to the 'wood cut' appearance, and does nothing to improve the appearance of the sculpt. To top it off, he's got a bit of a lazy right eye (even the one on the box has it), but that's actually something that Richards has as well, so I'm not docking them for it. These aren't super articulated. Are you surprised? I didn't think so. There's a cut neck, NECA style shoulders, cut elbows and cut wrists. There's also the cut waist and cuts at the top of the boots. Most of these joints move very little, with the exception of the elbows and shoulders. Even these don't do a whole lot though, especially with the odd pose. There's also a ton of gapping on mine at the cut elbow on the right arm. For an 18" figure like this, he has a surprising number of accessories. There's his hat, which is made from a soft rubber. It looks terrific, and fits much better than many of the Sparrow hats. 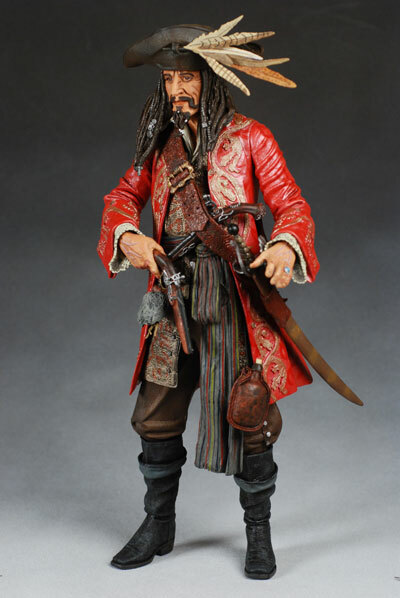 He also has two flintlocks, one that can be fitted in his sword belt, and one that can be carried in his right hand. The sculpts are different on the two, which is a nice touch. Finally, there's his sword, which can be removed from the sheath. You can also get it to fit in his right hand, but take some care. "You're in my way, boy"
"The code is the law"
"The brethren court has spoken"
"Present your piece of eight"
"It's not just about living forever...it's about living with yourself forever"
EDIT: One of my oh, so smart readers, Doug, let me know that it's "Sea Turtles, mate". Thanks Doug! The talking feature is nice and loud, with a clear tone for most of the lines. It doesn't sound a whole lot like Teague to me, but then he wasn't on screen for a whole long time, and I'm assuming they took the audio right from the film. The only real problem the feature has is that I couldn't get the motion detector to work reliably, and that's a pretty major issue. This isn't designed as a toy, so this score really won't hurt the overall, but it's worth noting in case you were considering it for your 8 year old. This is actually a pretty damn good price. We've seen most 18" figures run in the $40 plus range, and with the added talking feature and likely small production run, I'm surprised they were able to keep these at the cheaper price. Not much. You might find some variation in the paint quality, so keep an eye on that, but otherwise, he should be just fine. Teague will go along just fine with the rest of the big guys on my 18" shelf, but he's not at the same level as the original Jack. The folk art look of the head sculpt, along with the shiny jacket and weird pose, ends up hurting this one quite a bit for me. If those aren't issues for you, you'll be much happier, especially with the solid talking feature and great accessories. 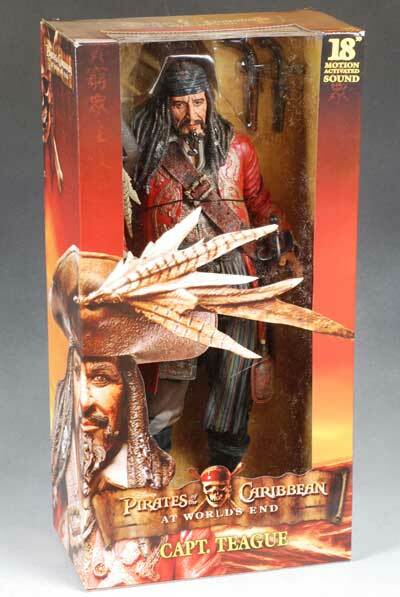 - Dark Shadow Collectibles has it in stock for $42.50. - Amazing Toyz and CornerStoreComics has him for $34. 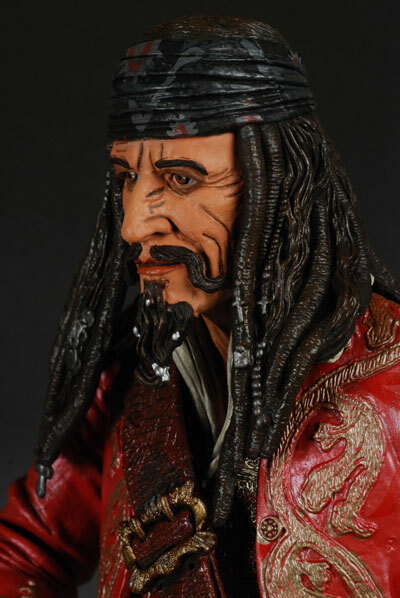 - NECA has had plenty of goodies in the 7" line, including the 7" Sao Fen, the series 2 figures, Clanker, the cursed boxed set of Jack and Barbossa, and the full first series, including Barossa, Turner, Sparrow and a dead Pirate. - there's also a guest review of Elizabeth Swann and my review of the second cursed Pirate, as well as my review of Pintel at Movie Poop Shoot, and Regatti here. - I mentioned how much I liked the terrific 18" version of Sparrow. 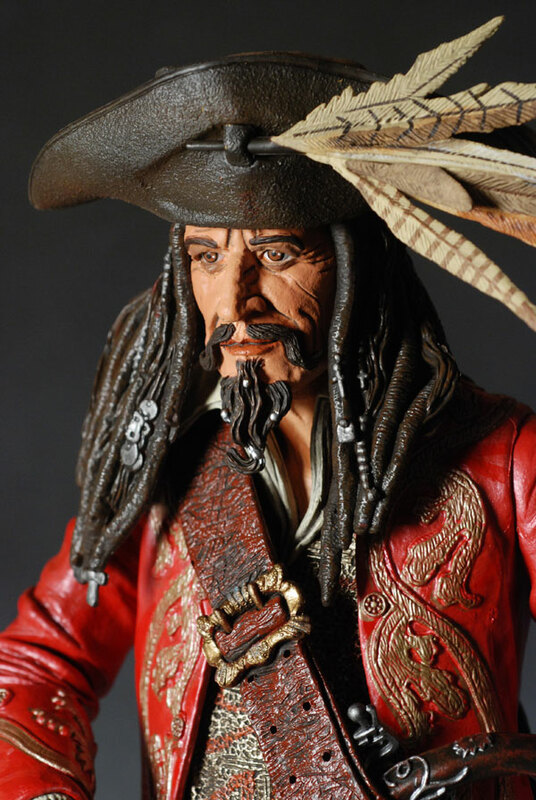 - Hot Toys is doing a fantastic job with their sixth scale series, including Jack and Sao.